A web server, shared hosting or dedicated server. 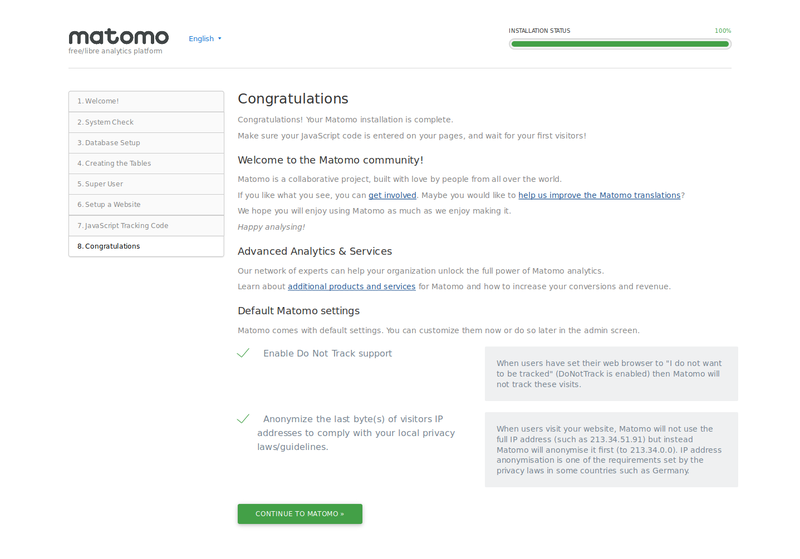 If you do not have a web server or shared host to install Matomo (Piwik) on, you can get a pre-installed Matomo in minutes. Try the Matomo Cloud (formerly Piwik Cloud) service created by the makers of Matomo themselves. 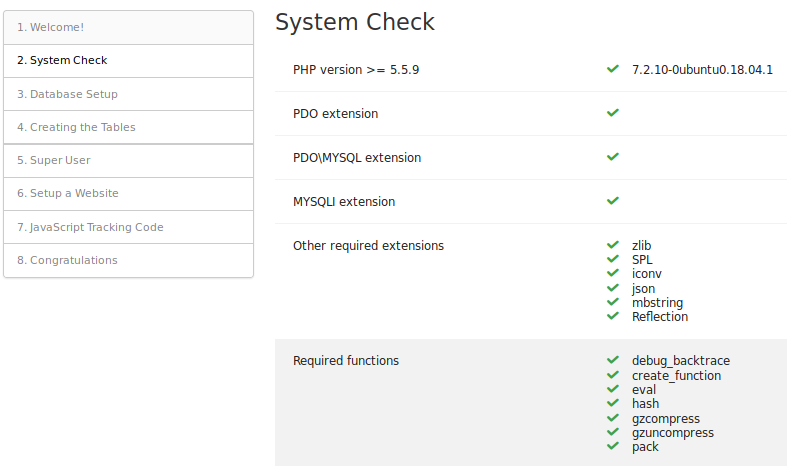 Check to make sure that your web host meets the minimum requirements to run Matomo (Piwik). If your web host offers one-click software (Softaculous or Installatron for example), you can install Matomo (Piwik) in one click. Unzip the zip file to a folder on your hard drive. This will create a “piwik” folder containing the files and directories. When Matomo (Piwik) is uploaded you can move on to the next step! Open your web browser and navigate to the URL to which you uploaded Matomo (Piwik). If everything is uploaded correctly, you should see the Matomo Installation Welcome Screen. If there are any problems, Matomo will identify them and help you out with a solution. You should already have set up your MySQL database. If you do not have the database information, you may need to ask your web host or technical staff. 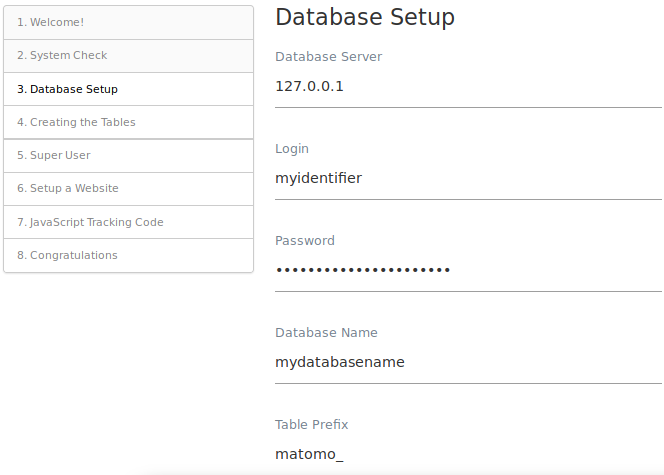 Security note: for added security, we recommend that you install Matomo (Piwik) in its own MySQL database and specify a username and password for a user that only has access to that database. 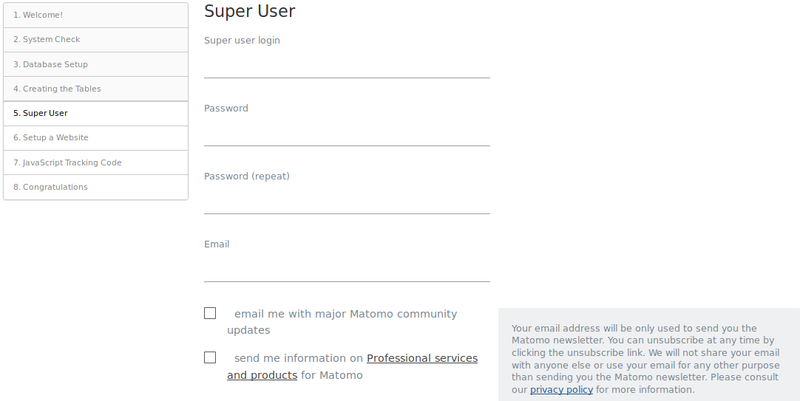 Do not lose this information; it is the only way for you to log in to Matomo (Piwik) for the first time. There is only one super user in each Matomo installation. The super user can perform administrative tasks such as adding new websites to monitor, adding users, changing user permissions, and enabling and disabling plugins. By default the super user will be signed up for upgrade and security alerts, as well as for community updates. Uncheck these boxes if you do not want to receive these emails. Enter the name and URL of the first website you want to track. You can add more websites once the installation is complete. If you use a CMS such as WordPress, Drupal or Joomla!, you can use an add-on, extension or plugin to make sure this tag appears where it needs to. Otherwise you will need to insert your tracking tag manually. 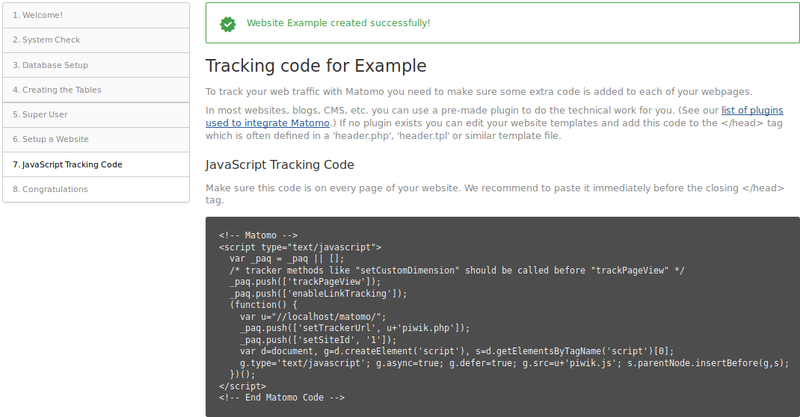 Matomo (Piwik) is installed and ready to track your visitors. As soon as visitors start arriving, Matomo will be keeping track of their data. Matomo reports are generated in real time, so you should see data in your Matomo dashboard straight away. Click Continue to Matomo (Piwik) » and log in to your dashboard! If something isn’t working correctly or you are experiencing an error, you may want to take a look at the Troubleshooting Guide. If you want to give other users access to Matomo (Piwik), or monitor more than one website, or rebrand Matomo or install third party plugins, you will need to use the Administration pages. Click “Administration” in the top menu, then click “Users” to manage users and permissions. When you have finished configuring Matomo (Piwik), you can set more restrictive permissions (ie. 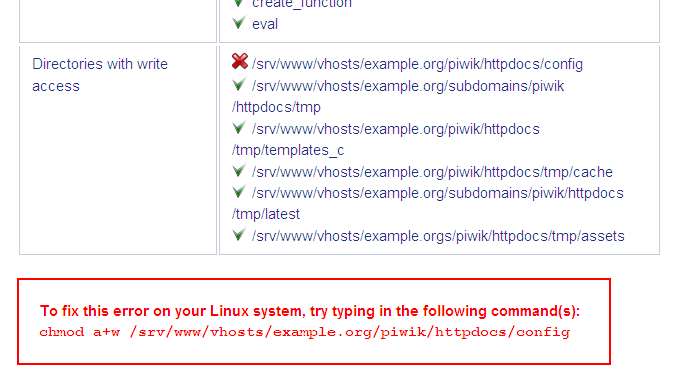 read only) to the “piwik/config/” folder. Matomo will always write its data inside the “piwik/tmp/” folder, so this is the only folder that requires write permissions. If your website is a medium or high-traffic website (more than a few hundred visits per day), we highly recommend to set up auto-archiving cron task so that Matomo (Piwik) calculates your reports periodically. When the cron is setup and the timeout value increased, Matomo dashboard will load very quickly as the reports will be pre-processed by the core:archive command triggered by cron. If you do not setup the cron, Matomo (Piwik) will recalculate your statistics every time you visit a Matomo report, which will slow Matomo down and increase the load on your database. Instructions for setting up auto-archiving can be found on the Matomo (Piwik) website at How to setup Matomo auto-archiving. Check also the Matomo (Piwik) Installation, Update & Optimization documentation for more information.